Because instead of rolling out FTTP at the same time as you guys, our government decided that VDSL and Cable will be fine for the future because "nobody needs more than 25mbps" according to our government. It'll be real interesting if VDSL areas (fibre to the node/cabinet) start crying out for upgrades in the next 5 years as 4k/8k/VR/360 content become more and more common. It'll be even more interesting if those people still vote for the same government that put them in that situation. It's been developed. 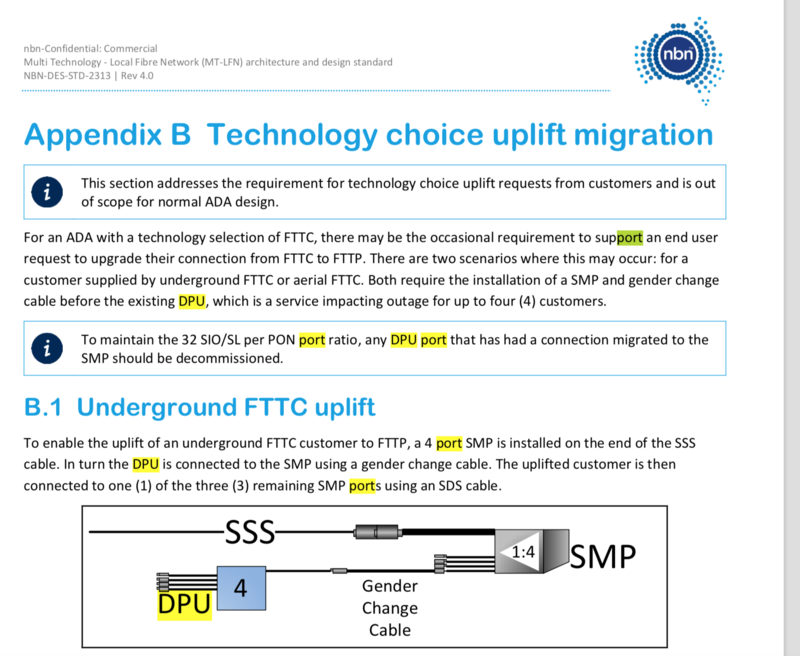 It's literally in NBN's design documents, with an exact schematic on how the splitter should be installed and how to re-attach the DPU to the splitter. NBN just won't release the option to upgrade. SMP is a passive fibre splitter (splits the incoming fibre into 4 ports) and SSS is the incoming fibre cable. Most providers have month to month plans with no upfront fees... why not just sign up for 50mbps for a month and then go up to 100mbps if you think 50 is too slow? Can't speak for other providers but with Aussie I can literally go to the account page on the website and change my speed tier right now, or schedule it to happen automatically next billing cycle. Do you think FTTC users (in this first iteration, without g.fast or other copper acceleration technology) will ever have access to 150mbps plans, considering it should be theoretically possible due to the short lengths of copper between the home and the street? NBN seems to be keen on keeping MTM technologies such as FTTC, FTTB and HFC limited to 100mbps, even though all 3 technologies are more than capable of hitting 150mbps or higher.